Duolingo, the language learning and crowd-sourced translation service founded by reCAPTCHA founder and Carnegie Mellon professor Luis von Ahn, just announced that it has raised a $15 million Series B round led by NEA, with participation from Union Square Ventures. The service never took any angel funding, but it raised a $3.3 million Series A round lead by Union Square Ventures last October. Ashton Kutcher and author Tim Ferris also participated in that round. As von Ahn told me in an interview earlier this month, the company plans to mostly use this new round of financing to expand its team in order to support more languages. Duolingo will also launch mobile versions of its service soon. The idea behind Duolingo is to teach users a new language, but also have them translate online texts. The service currently mostly uses texts that are freely available on the web to provide its users with real examples of a given language, but it’s also using these language learners as volunteers to provide crowd-sourced translations. Just like reCAPTCHA — which von Ahn sold to Google — is both a way of distinguishing bots from humans, as well as a way to crowd-source optical character recognition, Duolingo also combines two very different, but equally useful, services into one product. Currently, von Ahn told me, the service gets about 250,000 active users per week. The majority of these users come from the U.S. and 20 percent come from Latin America. This, for the most part, is a function of the languages the site currently offers (Spanish, French, German, and English). What’s interesting here is that users from Latin America use the service for far longer than their American counterparts (45 minutes per day vs. 30 minutes per day). As von Ahn, who was born in Guatemala, rightly noted, learning in a new language is often more of a hobby for people in the U.S., while it’s for bettering your life in Latin America. One interesting aspect of the site is that virtually all of the exercises a user sees are chosen by an algorithm that constantly evaluates a user’s abilities. The team is also constantly tweaking the algorithm based on the data it accumulates from Duolingo’s users. The fact that Duolingo is completely free, says von Ahn, is one of the reasons why the site is growing so quickly. In past interviews, he also often noted that Duolingo users learn about as well as users who use Rosetta Stone, which is often unaffordable for users in developing countries. Von Ahn plans to expand the number of languages supported by the site to 20 or 30 over the next few years. Right now, the focus of Duolingo is more on the language-learning aspects of the service than translations. 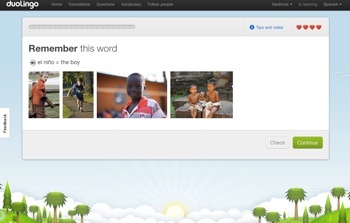 Soon, however, users will be able to upload their own texts and have Duolingo’s users translate them. That’s also how the company plans to monetize its service, as it will charge users for these translations. Duolingo says the quality of these crowd-sourced translations is comparable to those of professional translators.